Magda Gerber extolled the power of a single word that is fundamental to her child care philosophy. This word reflects a core belief in our babies’ natural abilities, respects their unique developmental timetable, fulfills their need to experience mastery, be a creative problem solver and to express feelings (even those that are hard for us to witness). 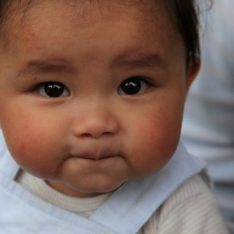 The word is a simple, practical tool for understanding babies, providing love, attention and trust for humans of all ages. 1. Wait for development of an infant or toddler’s motor skills, toilet learning, language and other preschool learning skills. Notice children’s satisfaction, comfort and self-pride when they are able to show you what they are ready to do, rather than the other way around. As Magda Gerber often said, “readiness is when they do it.” Ready babies do it better (Hmmm… a bumper sticker? ), and they own their achievement completely, relish it, and build self-confidence to last a lifetime. 2. Wait before interrupting and give babies the opportunity to continue what they are doing, learn more about what interests them, develop longer attention spans and become independent self-learners. When we wait while a newborn gazes at the ceiling and allow him or her to continue their train of thought, they are encouraged not only to keep thinking, but to keep trusting their instincts. Refraining from interrupting whenever possible gives our children the message that we value their chosen activities (and therefore them). 3. Wait for problem solving and allow a child the resilience-building struggle and frustration that usually precedes accomplishment. Wait to see first what a child is capable of doing on his or her own. When a baby is struggling to roll from back to tummy, try comforting with gentle words of encouragement before intervening and interrupting their process. Then if frustration mounts, pick them up and give them a break rather than turning them over and ‘fixing’ them. This encourages our babies to try, try again and eventually succeed, rather than believe themselves incapable and expect others to do it for them. This holds true for the development of motor skills, struggles with toys, puzzles and equipment, even self-soothing abilities like finding their thumb rather than giving them a pacifier. 5. Wait and observe to see what the child is really doing before jumping to conclusions. 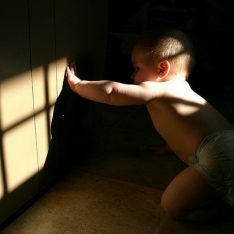 A baby reaching towards a toy might be satisfied to be stretching his or her arm and fingers, not expecting to accomplish a task. 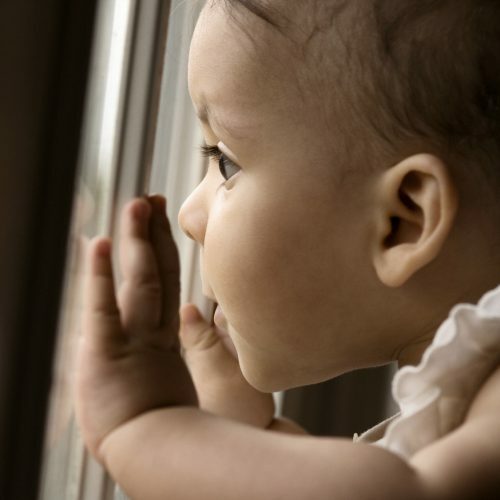 A toddler looking through a sliding glass door might be practicing standing or enjoying the view and not necessarily eager to go outside. Thanks Janet for another beautiful and life-changing post. Ever since getting to know RIE through your books and posts, I’ve tried hard to implement your ideas. I often struggle to wait long enough in the everyday stressful moments. But one that came rather easy to me was waiting for my daughter to be able to express gratitude and to truly feel sorry. It just never seemed right for me to demand those things from a baby/toddler who doesn’t even understand the concept yet or comes from a totally different point of view. So I chose to do it for her whenever socially required and just model. My daughter started saying thank you copying like everything else. Now that she’s almost four it’s just built into her language use (both in German and Italian) but she also makes a point of thanking for something specifically whenever she feels it’s appropriate. When she apologizes I can hear how sorry she feels. The first time she said sorry, it was days after the event, so it struck me how long she had reflected about it. I loved that it was her who chose the time to apologize and was so thankful for having waited and trusted in that moment. Thank you so much for giving me the tools to help her become emotionally competent. And I’ll say it again, your books in Italian could change the future of this country. Not kidding.